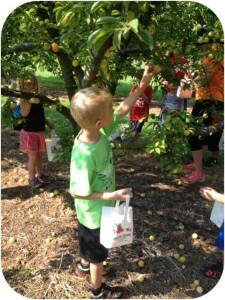 Apple Hill Orchard, located just north of Vincennes, invited Camp Green to learn about the variety of fruits they grow. 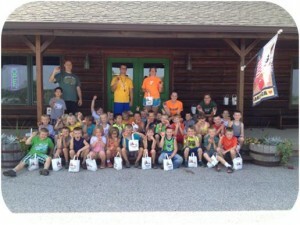 Karen from Apple Hill Orchard led the day campers on a tour and gave each camper a bag to collect fruit. Karen spoke about the lack of a bountiful peach harvest due to the harsh winter. The buds that produce the peaches froze during the negative temperatures. She showed the campers the Saturn peaches, sometimes called donut peaches, and helped them pick two each. She also showed them how to remove the pits from the center. The campers walked across the orchard to see the vast number of apple and plum trees as well as the irrigation system Apple Hill uses to keep the crops healthy. Karen showed the campers the difference between Red-hearted plums and Yellow plums. Campers each picked four plums of their choice. After learning how the orchard cares for the fruit trees and bushes, Karen took the campers into the orchard’s shop full of freshly baked pies and other treats to try some freshly made apple cider. She invited the campers to return with their families to discover the many things offered at Apple Hill Orchard.